Just for the hell of it. Could you even imagine doing that in one hit? My friend, Misaki, just told me, "Wow... I think you just blew up Neudiaz." You could probably kill every enemy on one planet on every difficulty all at once in one hit with that if you could spread the damage evenly. // Edel Fucil obtained and 10/10 on 13 AUG 2011. Gt:Chaostroop Send me a friend request! Yeah, it's only doable with the race Supreme Being. I hear when you select one of the planets you push your Photon Arts button and the planet explodes. Fat is the new Black! So long Xbox servers! Hello JP PSU, Infinity, and PSO2! It might be right. In this video the player's hitting criticals like 900 stronger than normal hits with the laser. "I kinda do YouTube "
o wow i guess its right for damage O.o anyways u hit 3 enemies at once with that laser and it does more damage than the shotgun so 3+ enemies ina row =best damage with a gun. Holy crap that pallet is sick. Two Love Infernos, two SN/Gs, and two Rattlesnakes. 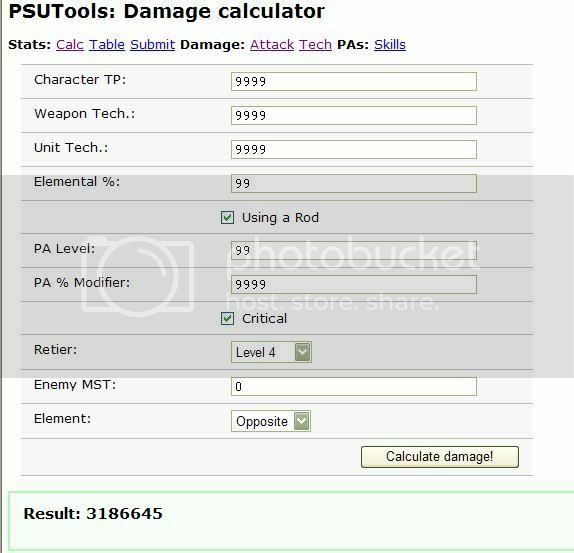 All criticals are 1.5x damage so 1400 x1.5 = 2100. I messed with the government and now my knob glows in the dark. Don't EVER mess with the forum sorting functions.